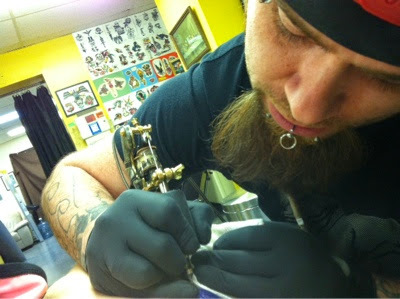 Unrelated photo taken during my last tattoo. We decided that we remebered each other from 2000 miles away. He used to shop at Food Fantasies, where I worked - in Illinois (I am in Oregon, remember). Last summer he lived in the exact same garage I just moved out of. Lick Fingers. Wipe Hands on Pants.